The trade system lets you trade valuable commodities between both your own and alien worlds. Alien relics, rare minerals, tourists, or even natural anti-matter, your freighters will carry them all. Although the game is complex, and the possible strategies endless, powerful help and advisor features, help you get up to speed quickly. 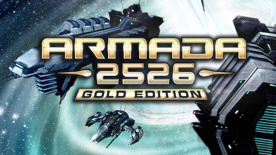 Unlike many games in this genre, Armada 2526 focuses on providing a game that can be finished in a reasonable time, and emphasizes battle and strategy over economic micro-management. All with one purpose: to emerge victorious and conquer the galaxy with your armada. All the content from both Armada 2526 and Armada 2526 Supernova; including all the latest updates. 3D Real-time battle system for fighting huge battles with 100 or more ships per side. Ground combat is integrated into the combat system, allowing marines to be landed to battle ground defenses while ship combat rages overhead.